I know I have a few projects that need a write up before this one but I'm just so darn excited about this I need to post the write up now! It is also a work in progress due to some unfortunate happenings that night, so this won't be the last you see of it! Look at this! How can you not love it? I was doing this as part of a group with other members from Project Hero and we were all trying to go for a more norse god/viking look rather than the clean one from the movie (as much as I love it!) Meredith always blows me away with her designs so I was ready to get started! Some poor planning last year cause me to put this on hold for a year or so but I'm actually happy this happened as it allowed me to have some time to plan. My first change was that I wanted to add some scaling to it. I don't like the versions of her in entirely green metallic scales as that's not the vision I had for this but I wanted something to give off that affect. I ended up finding green pheasent feathers that were the perfect size, shape, and color. I had to use these! I decided to use a corset for the top and ditch the coin belt for a "leather" belt with young Loki's logo (also thank you Meredith for suggesting I read "Journey into Mystery: Loki" it was a amazing!) in an antique gold finish to match the horns. 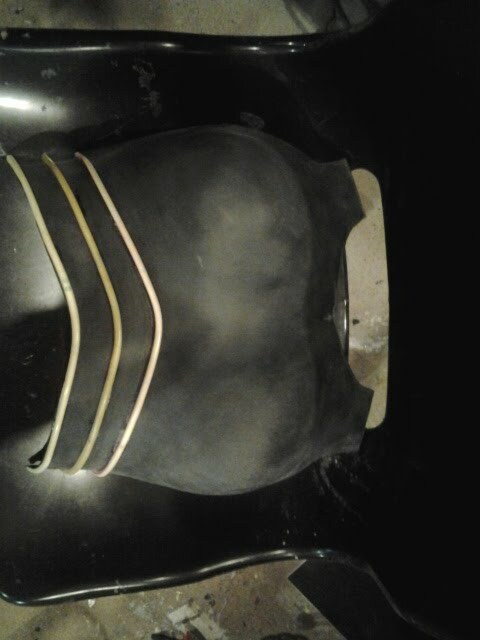 I then designed a top section that was going to go on top of the corset to house and protect the feather scales. I only wanted them on the top as an homage to the comics and a unique interpretation of it. I used the same material I was using for the arm wraps to cross over the feathers to tie the two together. I then sewed some brown leggings out of 4-way stretch "leather" (same material I used for the sides on the top of the corset) tea stained some linen I ripped into wraps for my legs, and cut all of the wraps for my arms and stitched them together with big "x's" like I did on the middle of the corset in the last picture above. 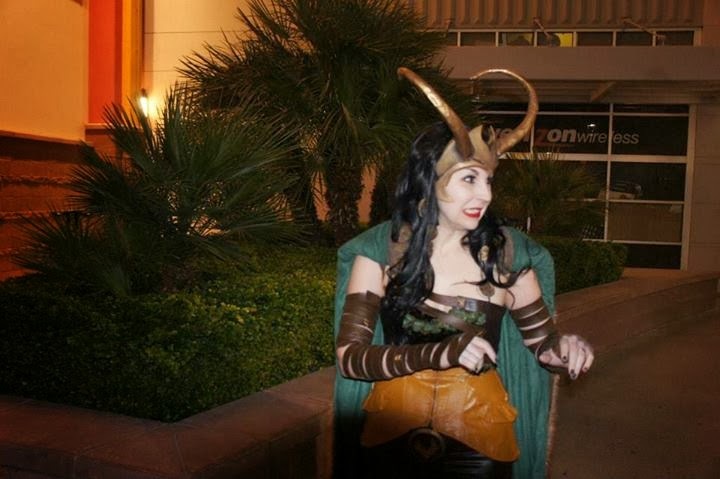 I then proceeded to the horns and the wig. I pepped a horn from the movie helmet and Garrick filled it with foam and sanded it down smooth. He should be posting a video or a write up soon on his process for that. I then templated out the base of the crown out of paper and fit it to a mannequin head. Once I was happy with how that looked (I changed it twice to make it look more like Meredith's design) I cut it out of various sizes of foam. I glued it together and Garrick took care of the rest of the construction. Once he had it all together I added some bands of thin foam around the horns to make them look like they were actual horns fixed and bezel set on the crown. I then weathered it to make it look like oxidized, antique gold and am going to go back and add some more detail on the horns to make them a little more weathered to convey the "old horn" or "stone" look. Even though Garrick sanded them down and resin coated them before he molded them to give them the bumpy texture of stone of worn bone. I was going for a more rustic look. The whole head piece ended up being very light and very secure. I don't have to worry about moving my head and having it wiggle or fall off. I do have to watch how I walk through doors, however. First design, wasn't digging it so much, too "Mera" looking. Needs a little more weathering but I am still pleased!! I need to get some better pictures of the coins. Alas, I will still tell you about them! I had an idea that I thought was awesome, might be a little nerdy but it's a cool detail. I did some research on the Norse version of Loki and he had three kids, Fenrir the giant wolf, Hela the goddess of the underworld, and Ritter a snake that looks an awful like an ouroboros. I thought it would be neat to have their faces on the coins. So I sculpted 3 designs, had Garrick mold them, and voila! Hair coins! I sandwiched small pieces of the wig hair in between them and glued them together. I also added some black rooster feathers to the wig just to add another subtle detail. I almost forgot the cape! The cape was simple. I wanted green and fur. I found both and sewed them together. I had some left-over gold thread from when I made Zuul a few years back so was a perfect way to clean out my thread box. i sewed the edges of this in gold as another homage to the movie design with the gold accents lining his jacket. I also wanted this to stay back and not hang in front of me so as to not ruin my feathers. Another costume detail form the movie I am in love with is the layering they did on their capes. They are set on shoulder pads to make them look heroic and pleated so the cape drapes beautifully behind them while keeping it behind them and not obstructing the front of their costume. I did something similar but no pleats as you cant really do that with fur. I made a harness (Meredith's idea actually) out of brown elastic that hold the cape on my shoulders without anyone being able to see the elastic. It's great! The edges of the cape are pinned up on my shoulders crating a collar of fur and a mantle so the extra fur collar wasn't needed. 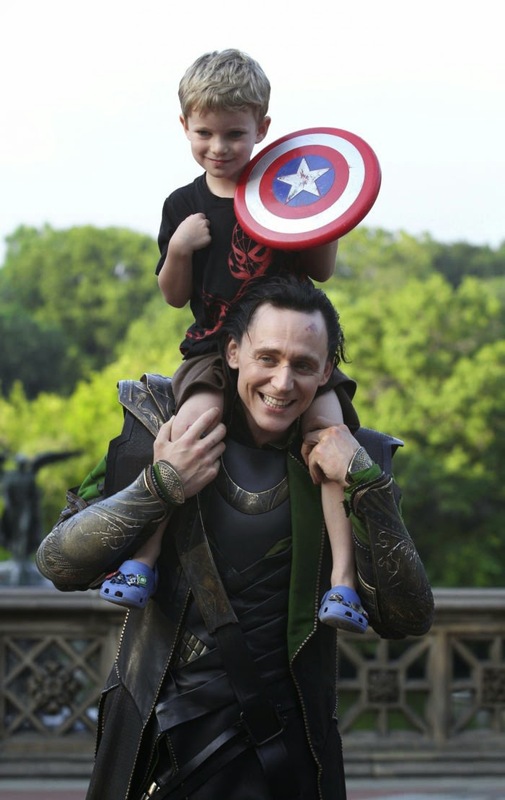 It frames the whole costume and shows off Loki's signature green enough to grab attention but not be over-whelming. Here's the finished product! The Warmth drive went fantastically and we collected a lot of clothes and blankets for the homeless. Also the movie was amazing and I am making Garrick take me again this weekend! Everyone looked SO GOOD!!! 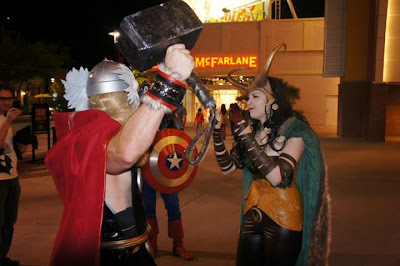 Paul is an amazing Thor and I'm so pleased we all decided to do a Thor group! Deb's Black Widow is fantastic, I couldn't stop staring at it!! 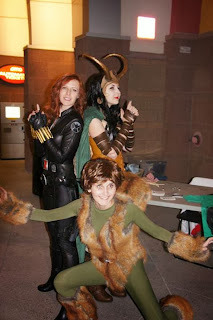 Cassie was great as Squirrel Girl, best one I've seen yet! And Jose was an awesome Cap. Charlotte! You are amazing! thank you for taking pictures!! Gah!! I love this picture!! Everyone looks so good! I did something extremely dumb this past weekend causing me to have some unanticipated "free" time. Let's get this out and over with. I ran myself over with my own car. More specifically, I ran my leg over with my car. No I was not intoxicated in any way, shape, or substance. It was a perfectly timed accident. I stopped my car on the curb. I forgot to put it in park. I tripped getting out of the car and fell on my knees. My car ran my leg over. However I am very much on crutches for the next week at least. I don't think that will ever heal. The only way to handle this now is to laugh about it. I do have some serious road rash that Garrick is tending to since it's too gross for me to handle looking at. (I have a high pain tolerance but a low threshold for seeing blood/gore on myself, it makes my anxiety run amok). I am lucky to have a great husband like him. No I won't post pictures of it. I will be posting pictures of older projects I haven't gotten around to for the next few weeks. I've been meaning to post about this one since Phoenix Comicon. This is my last minute build for DeathStroke from the series "Arrow." Garrick and I had started watching "Arrow" and were instantly obsessed. We love when there is a good "real world" telling of a character and this is just that. 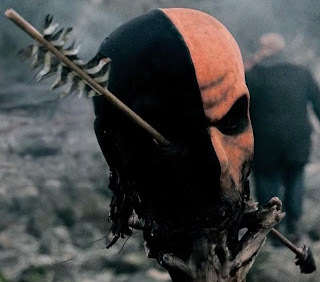 I don't have a huge attachment to Slade aka DeathStroke as a character. But look at this mask. There's so much weathering to be done and texture to create. This was a much welcomed challenge for me. I also have a friend who really likes Deathstroke. So I was thinking if this came out well I'd make one for him. Since I was happy with the outcome of this project, I'm currently working on a second one for him. I had a hood pattern already made for DeathStroke since I was commissioned to make a fabric mask for the web series "Super Power Beat Down." For that one I we used the same face shell for DeathStroke as we did for Deadpool. 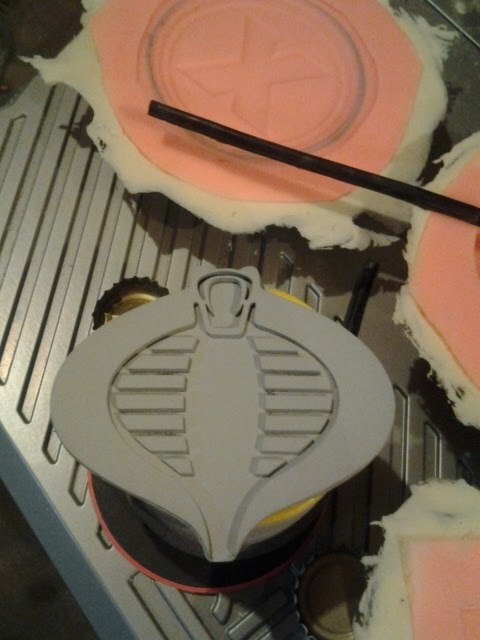 This one that I made for myself I sued the shell we used for the Cobra Commander hood. You can watch the video here. This was a pretty quick build since I already had the parts. I didn't take as many in progress photos as I would have liked since I was on a tight deadline but since I'm making a second one, I'll take more this time around and post them when I'm done. I first decided to double up on the material when I was sewing. I also went for a brighter orange, since that's what I had and what I knew my friend would like. To be honest, I like the actual prop a lot, but I like this orange better. It's not exact, it's how I preferred it, sometimes I like to change things on my preferences, this is one of them. Doubling the material was a great idea. When I started to cut into it to make it looked frayed, the double material really filled out the empty space. I tried to cut along the same lines as the prop undercutting everything by a bit so when I went back later to burn the material it wouldn't burn it up so high. I used scrap pieces of material to test out all of my paints and burning it first so I would know what to expect from the material. (Always a good idea to test techniques out first on scraps!) I did a combination of paints that would be more of a natural color, more dark browns, ochers, and oranges so it would look more like it was weathered on an island rather than the stark "cell shaded" looks you get with just blacks and grays. I built up a little of the paint in a light layer to place where all the weathering would be. I took care to work it around the eyes, nose, and mouth very lightly to give it some character and to look like someone was actually wearing it. After this initial layer was done came the fun part...playing with fire! Spandex doesn't really burn, it melts. This was a lesson in getting that reaction to work for me, not against me. There was a lot of watching melting fabric drop and hope it didn't land on your toes and also using a respirator. This process stank. I also don't know what kind of harmful fumes it made by just burning the synthetic material but I figured breathing it in wasn't a very good idea regardless. Once this was done, I let it air out a bit so it didn't stink up the house, and brought it back inside for some more weathering. I ended up wanting to make the whole mask look dingy and filled a spray bottle up with really strong coffee and paint water. It took some rubbing and workign to get the material to absorb the water but it did. I would do a few layers of specific weathering in between and then drench the whole mask with the coffee/paint solution again. I did this about 3-4 times until I reached the point where i wanted to add some more substantial paint detail and was happy with color change from the solution. This was my last step in painting. I made up a few different shades of the brown, orange, ocher mixture some with black in it and started to go heavy on the areas that had a lot of detail to them. I didn't want to over-do it too quickly, so I built this up in layers and checked it with the origional frequently. I think it came out pretty darn close! Like I said, the color is different but I'm happy with it and had a ton of fun making it an learning new techniques. I am really excited to do more masks like this in the future and really push the limits on what fabric masks can look like. This was the first mask I made as a display piece only. Technically you could wear it but it would probably smell weird and be pretty itchy due to the burning and shredding of the fabric. If I can find some driftwood that's not crazy expensive I'll probably put this on it as a display and put the arrow in it's eye. Cats. Demons. Glorious red cloaks. You must be thinking, “This must be something out of Jackie’s crazy dreams.” Nope. Just another crazy anime series. Crazy good! I finally got to make an anime costume. I am beyond excited! Our friend Alex has been wanting a Chaser John Doe (Yumekui Merry) costume to wear to Anime Expo now for about a year. We hadn’t had the time with other commissions last year but this year we were able to fit it in. And fit it in we did! There are a few things I will go back and change (as there are with most fully wearable costumes) but altogether it came out great. As my friend Shannon pointed out, this was a perfect fit for me since almost all of my favorite characters in animes end up having long red coats or capes. This was no different. It didn’t take much to get me on board . I had a lot of fun making this one and working with Alex on this. I was able to ::gasp:: weather it as well!! Garrick did the mask, ears, and cast the face pieces for the boots. Alex and his dad made the “sword.” It was truly a group effort and I am very excited with how it came out. We learned a few new techniques along the way which is always a bonus. Garrick decided to tackle the mask and ears. He should be doing a post about it on the Prop section at the top. New format you say? Why yes! We decided to brand both pages with KnowOne's Designs and separate the 2 into sewing and props. As cleaver as one black catsuit is, we should be more consistent. That being said... here's the new layout! Since this is the sewing section let me tell you a little about what I did for this project. I tend to start on the one part of the costume that makes me the most excited about making it. Once I have that planned, the rest usually falls into place. For this one it was the cloak (surprise). I started with the hood since that was the part I needed the most time to plan. I had an idea of how to make it work but I still wanted to give myself some time in case I had to go a different route. I bought a crepe-like material that was very light weight and had a very worn texture to it. Anime characters usually walk a fine line between unnaturally pristine and clean and weathered. This was no exception. I wanted all of the wear to be in the cloak since that was the part that had the most expression. Hence looking for a very expressive material. I needed something with character and that was very light weight. John Doe has a very jagged point on the back of the cloak's hood and I wanted to try to keep that as expressive and exaggerated as possible. I also wanted to keep some contrast since this anime is drawn with a lot of contrasting blacks to off set the white and the red in the costume. 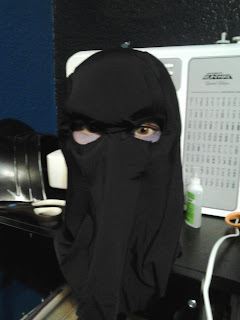 I decide to put black in the hood to off set the mask and hide any extra parts of the baclava that you might see. The rest of the cloak I left red so I could weather it on both sides. This would have a better effect if I were wearing the mask buuut this was done in a short amount of time and as usual, I didn't take as many pictures as I would have liked to. I do like the frayed edge this material had that I left on the hood. Added bonus for pre-existing creepy features! Once I was happy with how the hood looked I started on the cloak. 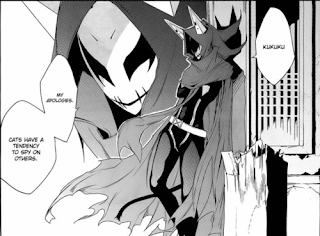 It is actually in 3 pieces, the hood, the shoulder "shawl" and the cape part. I did this since the way his cloak is drawn I couldn't figure out how to make the it look the same and keep in in one single piece. This way it looks like it's all together but it's not. It's also easier to put on this way. I made the general shapes for everything, sewed it two layers thick and then started weathering it. My favorite part!! I cut the cape at the bottom to look like it's been ripped, stepped on, and caught on things and shredded. I then soaked in in coffee concentrate. It smelled glorious for days until the next step. I then spray panted it in a way to take into consideration how fabric would wear and adsorb dirt, from the ground up. The darkest parts were closest to the ground and it gradually became lighter the farther up it went. Again, I wish I had taken more pictures. Once I was happy with this I moved onto the rest. I used a black catsuit for the base of the suit (surprise!) 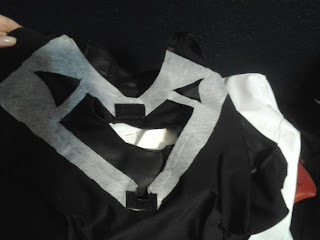 and sewed some white bias tape up the front for the lines. I got some white gloves, sewed a more flared cuff on them and made some boot covers. Alex really wanted the toe to be square so we went looking for some steel toed bots and then I padded the toe with some quilting batting to make it extra square and boxy. I was pretty darn proud of these! Garrick found a tiny oval mold and cast the little John Doe faces out of resin for us to glue to the boots. 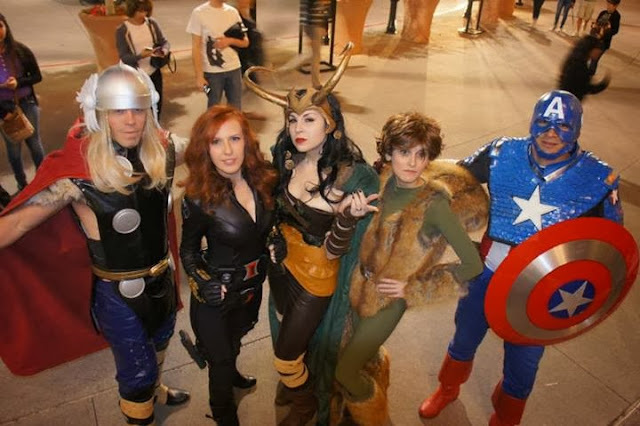 Small details are always the part that make a simple costume go the extra mile. We could have done these out of fabric, but they looked so much more polished being 3D and cast out of resin. My second favorite part was the belt. My machine can sew soft leather! This was super exciting for me. I used the base of an adjustable webbed belt and sewed the soft leather on top. I then cut and glued the little belt loops and the front and then sewed them for added stability. I wouldn't use them as functioning loops, but at least they're not going to get damaged. Not the best picture but now you can see how the tail attaches and how I sewed the leather on it while still keeping it adjustable. 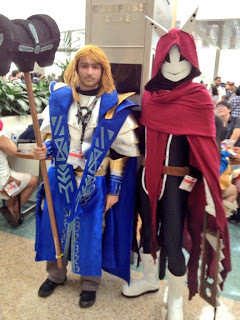 And here it is in it's natural habitat, Anime Expo! 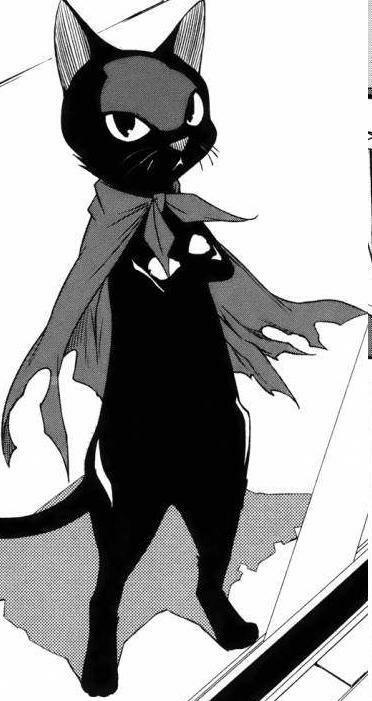 Also, he has a kitty form...in a cape! "Hey Jackie, are you going to build anything new or are you just going to keep re-doing the same stuff you've done over and over again?" I like getting things right the first time and in this hobby that doesn't always happen especially when you're trying new materials and processes for the first time. That means I have to re-do them until I'm happy with it! Quorra has been a lesson in that. Mistakes. Failures. Success. Rinse. Repeat. Oh and lights, lots of lights. This time I think I am 99% happy with the outcome. I'm mostly done with the sewing and about to hand it off to G to do the lights. Oh and we bought a helmet from a guy on the RPF named Crimson490 after our mold broke last year right before con. The guy does some great work, I am super pleased with this helmet. (when I find if he has a FB or something I'll link it) I have also passed that on to G to put lights in and shine up. G gets to do all the dirty work. I was (and still am) working with limited quantities of material and trying to stay on a "budget" since con is approaching and I'm actually trying to make more money than I spend this year. I tore apart the old Quorra costume I had as a pattern (QV.2 RIP) and made it a little bigger just in case. When working with limited materials, better to have to cut more off than not have enough. I was also going from a not stretchy material to a 4way fabric so I wanted some room to mess around with the fit. 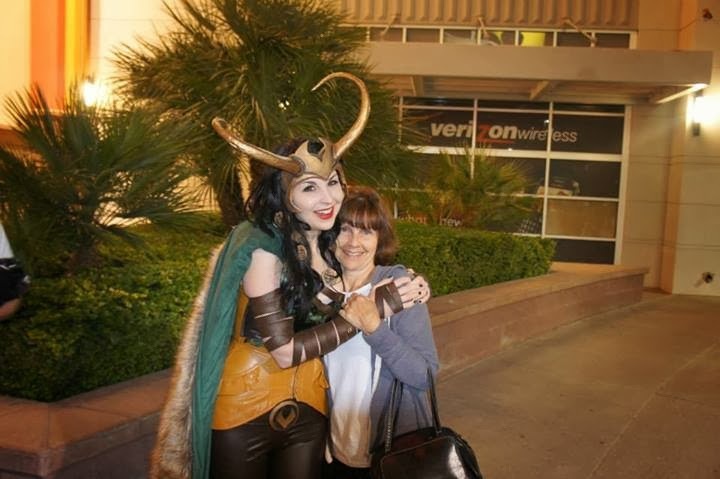 This is my most favorite part of this whole costume and of sewing in general. The fitting!! I feel like I'm sculpting with fabric. 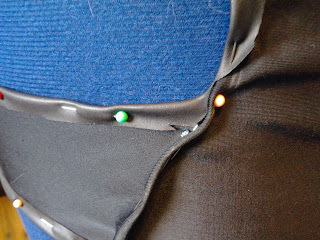 I pinned my material down in it's appropriate spots, wrong side up and started pinning and tucking. I do it this way so I can draw on it if needed with chalk and so when I pin everything and go to sew, my seams are all done for me and I don't have to flip everything the opposite direction. I was beyond ecstatic to be using a 4way stretch material this time instead of the kind-of-maybe-on-a-good-day-stretches-a-little-bit vinyl I used the last two times. This is a matte 4way and it looks perfectly rubbery which fits what I was going for exactly. I waited to sew the general fit of the whole suit before I cut out the chest pieces so I could draw that part on there once everything was the shape it was going to stay. When you have cut outs like this, you don't want anything changing how they lay or are positioned. Sewed that all up. Did some fittings on myself and the dress form with the shirt underneath and then it was time to fit the disc mount. Garrick made a new buck for his vacuform table that was more even this time. Cut that out and fit it to where I wanted it. I decided to keep the whole underpiece of the disc mount since she looks like she has a tiny "turtle" pack under her disc. I have since made it a little tighter fitting (my dress form has wider shoulders and "ribs" than I do even thought I set it to my measurements. Just a quirk I guess) so it would have less ripples in it. I also didn't want to make it too tight since when the lights go on it a lot of the stretch will be disabled do to the EL tape. I also am going to be putting the skirt part on after the lights go on since I had some placement issues do to doing the skirt first last time. I did try something new with this. I was really concerned about using too much velcro around the neck area and having it be bulky looking but I needed a way to stabilize that area from stretching too much or at all. So I decided to try out some fusable interfacing! Never used this stuff before since I've never made a collar that's needed it. It's weird. It's also awesome. I wasn't expecting it to stretch in one direction so I had to plan around that. I also wasn't expecting the test piece to stick to my steaming cloth. I think the directions should have been a little more specific. Or I need to learn how to read...who's counting?! No more moving or puckering on that cut out! Whoo hoo! I did put some velcro in two spots to keep it held down, but not nearly as much as I thought I would. I am using the same boots because they're awesome, the same pants (they are also awesome), and gloves (they need a repair but are thirdly awesome). I'll post more updates when G does the lights and helmet. I know I usually post music I was listening to while I work and I'm still going to do that, but I don't know if Quorra would really listen to it. I needed some motivation and inspiration lately and this completely UN-likely source did the trick and gave me a new favorite artist. Macklemore is a really inspiring guy who is not afraid to call out his entire genre on their prejudices and inconsistencies. Thank you for reminding me that I do like hip-hop when it's not all about strippers, blow, and gold. Although he does have a song about gold, not feeling that one, but you get what I mean. I'll show you what G and I have been working on for Meredith when he puts up his post. She just launched her kickstarter for Hinges, check it out here. After much holiday fun time, getting the flu, and devoting my life truly and completely to everything Deadpool I have returned with a new black catsuit costume! Surprised I haven't run out of new ones? Seriously, I don't think in two life times I could even attempt to make every comic character's costume that is a black catsuit. Yes, I know that was good planning on my part. A year has come and passed since they decided to delay the next G.I. Joe movie until 2013. I cried a little too. FOR JOY! There was NO WAY IN HELL I was going to be able to finish it when it was supposed to be released last year. 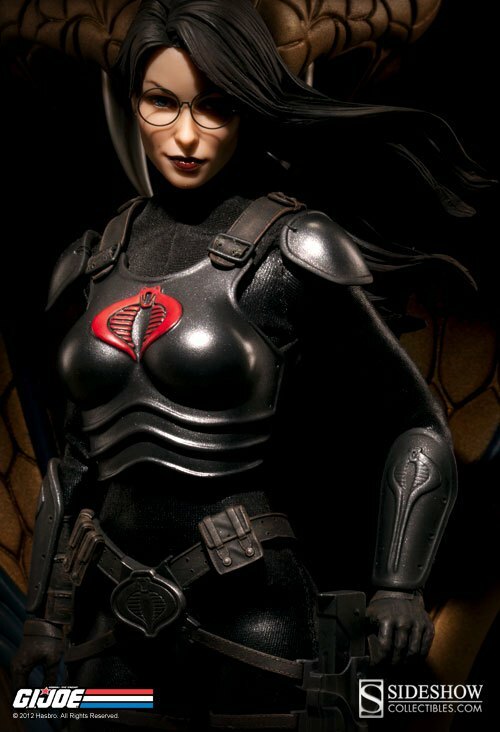 Also, the first movie was ehh...Snake Eyes costume is way more B.A. 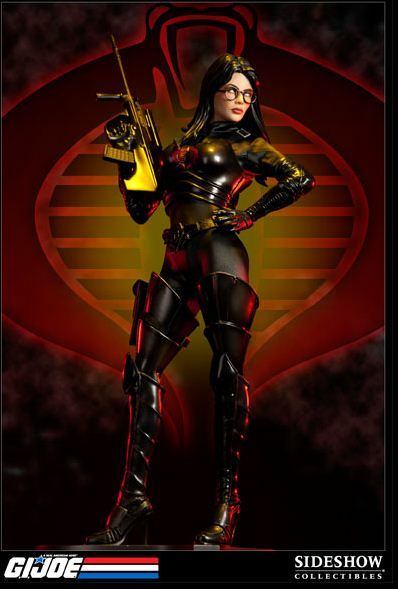 in this movie and Cobra Commanders new outfit is also significantly more awesome than the one they made J.G.L wear. I am bummed out about lack of J.G.L although he's probably ok with it. The marketing they're doing is pretty cool too. Lots of billboards with a steel cobra on them saying "Do you have what it takes?" making them look like military recruiting ads. 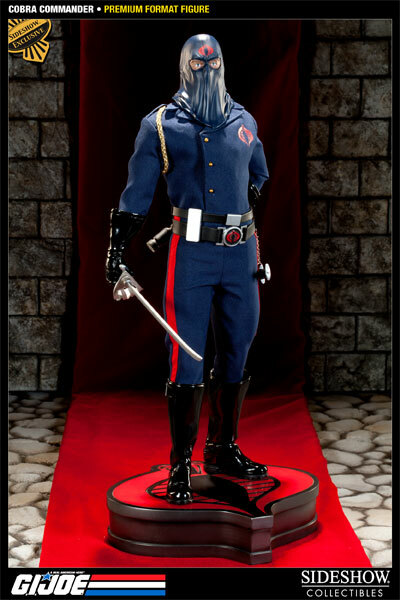 Cobra Commanders new outfit is way more awesome than the one they made J.G.L wear. Good thing for Project Hero that we're doing a Cobra group this year. We have, Storm Shadow, Serpentor, Zartan, and Shipwreck so far. (yes I know Shipwreck is a Joe). Can you guess what Cobra's Garrick and I will be? 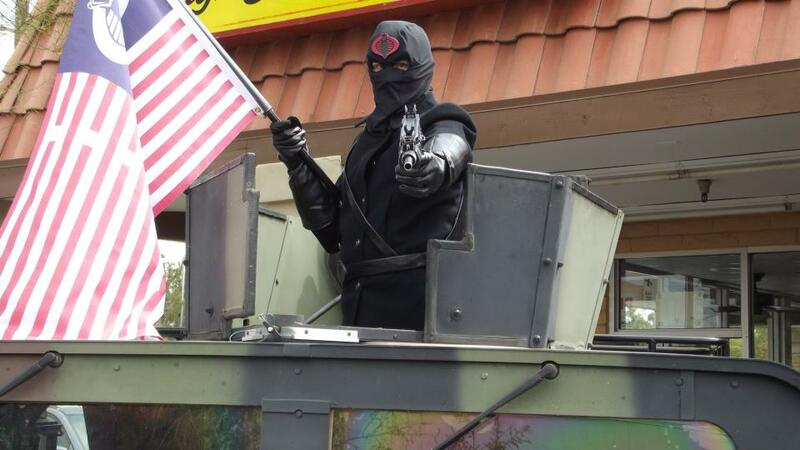 Cobra Commander and Baroness. Who else would we pick?! Garrick loves playing characters with grating, nasally voices. Plus, he gets to walk around and yell at people to do his bidding. Much like he does as the Monarch. Fun times shall be had by all! 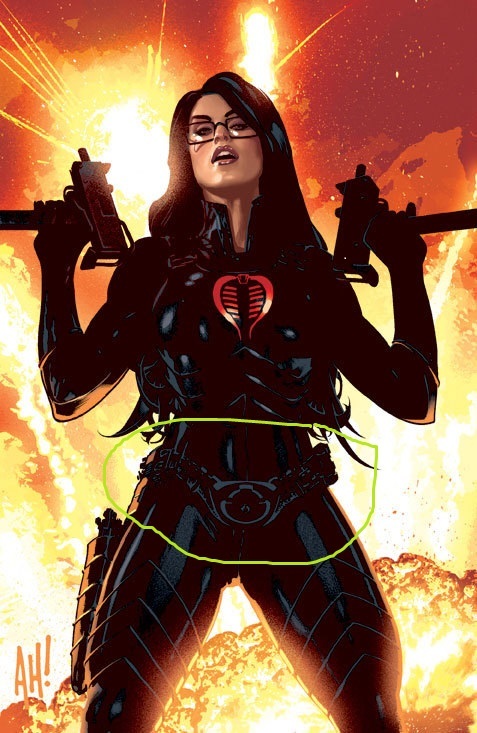 This is what I'm basing Baroness off of. 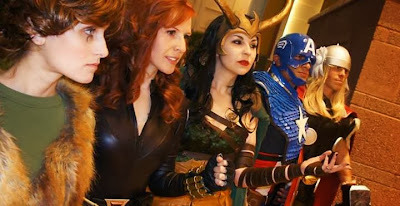 I like the gauntlets on this one best. I Like the belt in this one. I would like to add a few details to this to make mine a little different from the ones previously done. I found some awesome black small snake skin print vinyl to use as an accent. 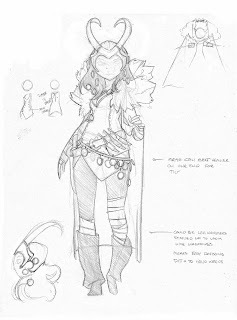 I am going to add some inserts to the suit with this and do most of her accessories out of this i.e. belts, holsters etc. 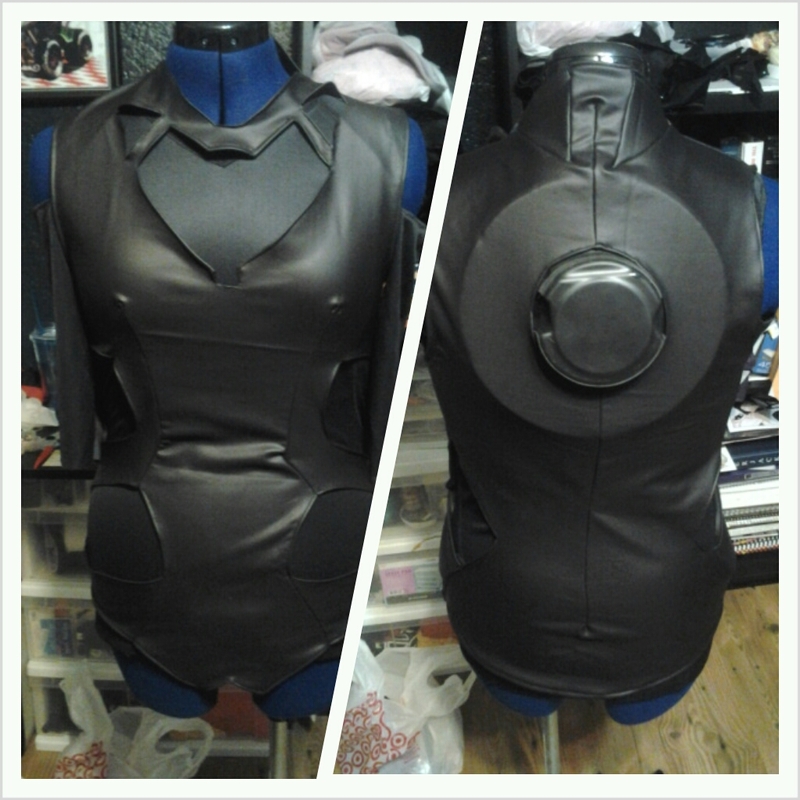 I just finished the contouring on the catsuit and adding the snake skin inserts down the sides. I'm going to be sewing the details on the legs instead of having them as armor. I don't think my thighs would work or look right if i tried to fit them in that armor. I'm going to off-set this difference by using a matte black spandex and outlining it in piping. It sounds good in my head, let's hope it's just as awesome executed. Garrick is working on my armor for me. He just finished his vacu-form table and is going to try to vac this. Were trading since I'm sewing his Cobra Commander. If the armor is a success we might be offering this for sale. Stay tuned on our Facebook page to see if that comes to fruition. Garrick wanted a creepy version of Cobra Commander so the voice would sound even more ridiculous coming out of this mask. His is going to be black and red to match me and because the jacket we found is black. (Deadpool is taking up all my time ((you're welcome)) so we are buying a coat and mask for this to save time. The mask is SOOOO creepy I love it. After a few re-designs, some errand running, and a few back to back work nights, we have some progress to show you! We have had to pick up the pace on this one since my job told me last week they are flying me out the week of the event for a training thing. Sooooo that mean's all my shiz needs to be finished before I leave, in 2 days!! I have my suit all sewed and am pretty happy with it. There are always things I would like to fix/add but this is good for a trial run on the 30th. I still have time to change and add things before PCC. I'll show pictures of it when I do a make-up test with my wig and glasses. 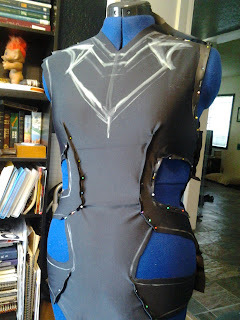 Garrick has the work-up on the buck we made to vaccu-form the Baroness armor. You can click the link to his blog "KnowOne's Designs" at the top of the page to get to it. We should be doing the back of it tomorrow and then I'll be strapping it together with nylon webbing and the snake skin vinyl I've been using as accents for all of our accessories. I had the buckle laser cut after many failed attempts at trying to cut something this small out of foamies with a dull exacto knife. I had had enough! I think we'll probably be going the laser cutting route form now on, it just looks so clean! 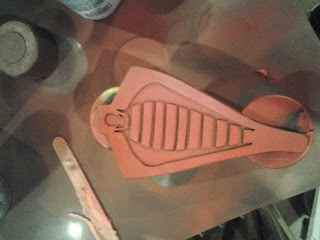 This is going to be the bracer for Baroness. I originally had this cut laser cut too but it ended up being too small. I decided to go with an easier design to cut out of foamies and based it off of the Sideshow statue above. I am pretty proud of it and it's symmetry. Still laser cutting things in the future, but I'm down to the wire on this one. 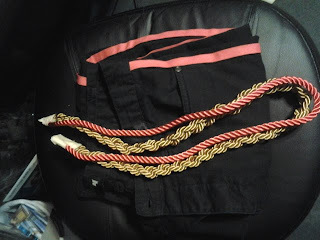 This is what I have done for Garrick so far.... His pants, his belt and sword, and his shoulder rope thing.....yea... Keep your fingers crossed our stuff gets here in time! 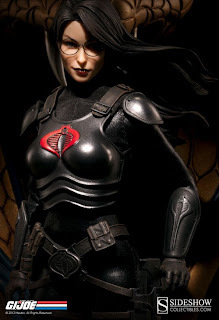 Since I haven't been able to do too much work on Cobra Commander due to supplies not getting here, my song choices have been aimed at Baroness. She would listen to a lot of Florence + the Machine and Marina and the Diamonds as both are very classical sounding but totally weird at the same time, just her style. I woke up the Friday before the event fairly optimistic that fate was going to smile down upon Garrick and I and deliver the pieces to our costumes that day. Wouldn't that have been nice? Well the mail came a little early that day and there was nothing. Abso-frigga-lutely NOTHING. So I panicked. Everyone needs a good panic every now and then. Mine are just more frequent than others, whatevs, get the creative juices flowing. I ran to the closes costuming store hoping (here that optimism again) they would have something I could use as a base for this Cobra Commander hood. 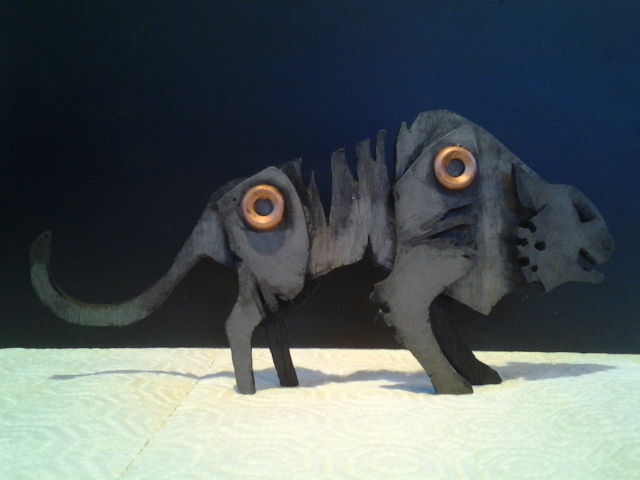 I wanted it to look executioner style and kind of weathered and messy so it was extra creepy. I found nothing. I walked around a second time and found nothing. I don't know what I was expecting to find the second time, honestly, but I gave it the old college try. I decided I needed build this thing with stuff I could find in an hour. I went back to the "batman aisle" as I called it to see if there was something there that had a good base to use as a scowling brow profile. I found one of those kids masks, that have the batman face and ears and are a weird rubbery-hard plastic. Good place to start. I then looked for some pre-made executioners hoods (trying to cut down on time people!) Nothing. they had gimp masks, but not and executioner hood. Really costuming store? This is a Halloween staple! 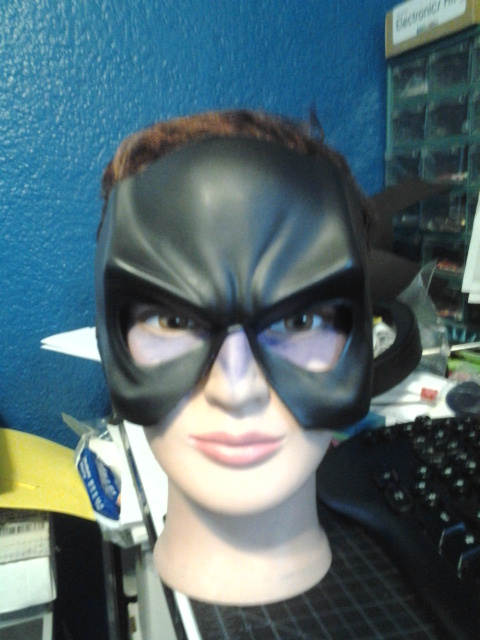 Took my Batman mask and bought some more crepe wool so I would have to come back later to get it when I go to re-make Garrick's Monarch eyebrows and beard. I still needed a coat and some coffee, so it was onto those two. I stopped at a few Goodwills and they had nothing. My optimism is waning at this point. I decided to use the coat Garrick had at the house that he got from his Dad when he was in the Navy and start there. (I still can't tell if the thing is navy or black, it's so close to both it looks like whatever you put it up against) I went to SAS to get some silver buttons for it so the gold didn't clash. Then it was time for coffee. Let me just put this out there, I am an introvert, I have to prepare myself to be in groups of people. When I go to drive-through place I am going there to get something and not commiserate with anyone. Then enters Dutch Bros. I love that they have coconut milk. What I don't love is that they basically crawl into your car and ask you how your day is. They don;t care that I have less than 24hrs to build a Cobra Commander costume and would porbably think I'm nuts if I told them. So after this dude basically held my coffee hostage while he gave me a weird pep talk I was onto the actual construction of this beast. I was very focused so I didn't take too many progress pics, but this is basically how it went down. I was pretty impressed with myself. I believe I yelled to Bastion that "I am a magical costuming unicorn!" This weird combination of mis-placed optimism and unwanted pep-talks I guess had worked! We then stayed up till about 3 in the morning putting the final touches on my armor and Garrick's costume. Here's the part you really wanted to see, PICTURES! Bam! I cam together! I need to get Garrick a coat that isn't wool so he doesn't die and I think I'll make the hood a little bigger so I can get some more creepy wrinkles around the eyes. I am also going to spray it with Plasti-dip to it gives it a cool texture. 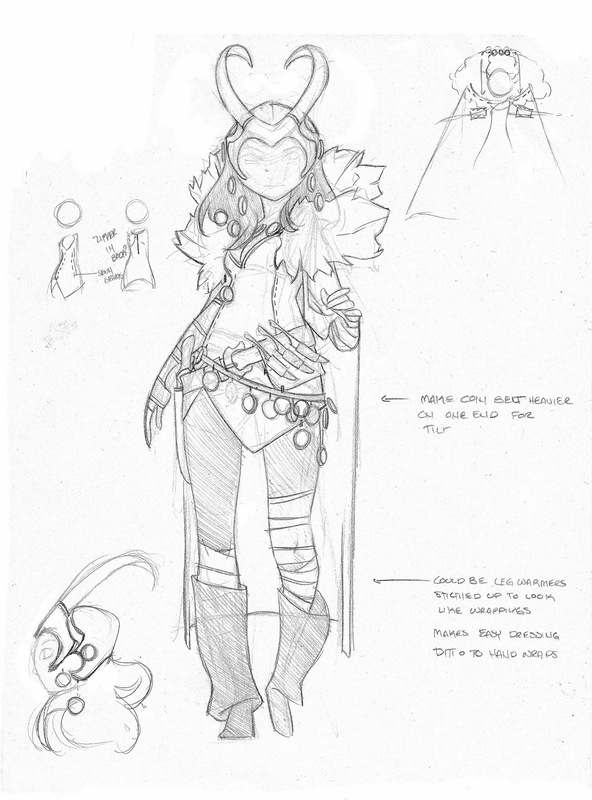 I am going to make new gloves for Baroness so they're not so bulky. Also going to trim the armor out on the back so it has more shape. Yea weathering! I learned a new skill, yay life achievement! Garrick's really liked being in the turret. We were able to raise about $430.00 for Wounded Warriors so far with Project Hero. Check out our facebook page to see the auctions of the sketch cards that Ben Glendenning did for us to raise even more money for them. Thanks to everyone who came out to support the cause and Deb and Paul for putting together such a great event! Ok well thanks to everyone for that day, the Morgan family for helping out and generally being awesome, Jason and his wife for driving out here, Charlotte and Bill for making me ride that bull (you know what I'm talking about) and Brian and Whitney for filming it. Love you guys!!! The sewing half of KnowOne's Deaigns. Now you know my secrets...I make and dress up in costumes in my spare time. I also read comics and play video games...let's be honest, none of these were secrets ;). 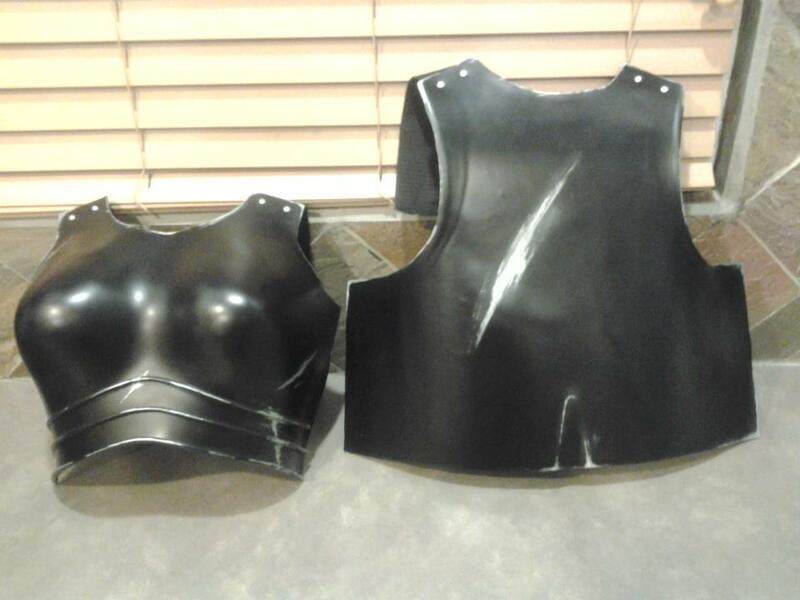 I am an aspiring and constantly improving seamstress/prop builder/make-up artist who would love to work on pieces for movies/tv one day. So feedback is always welcome! 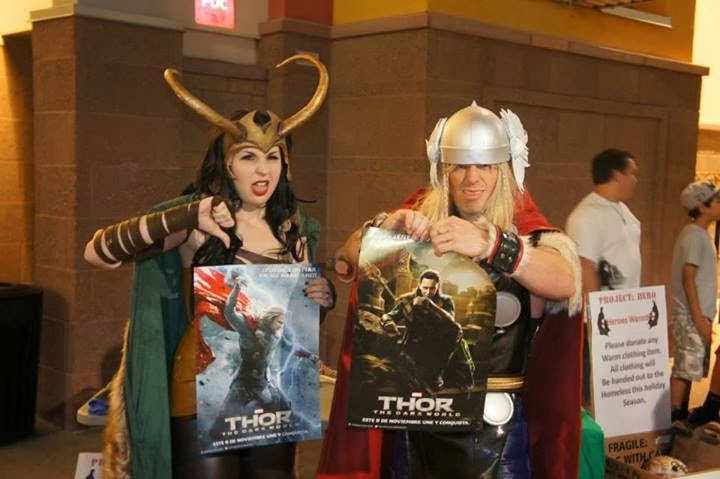 Oh and my husband does the same, just with props! Check out his blog by clicking the "Props" tab on this page. Thanks for reading! *Side note the header for my blog is the wonderful work of Adam Hughes. I used all of his images because he's the first person I look to for a great reference picture. Thank you to all of the other talented artists that I reference as well! Why yes! If you are interested email me at jbacker19@gmail.com and we can talk about your ideas. Will you help me with my costume? 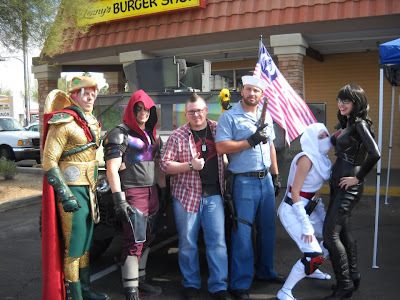 I want to make a Deadpool costume, can you help? Will you be at ______ con? Check our KnowOne's Design's "Like" page on facebook where we will post which cons we'll be attending and who (or what) we'll be dressed as.